The candidate is from the DMK's ruling family, and the sky is the limit -- for both expenses and expectations. A Ganesh Nadar reports from Thoothukudi. Thoothukudi, in southern Tamil Nadu, has seldom been the focus of attention during elections, but this time round it is the cynosure of all eyes in the state thanks to the high-profile clash between two women leaders in the constituency. Kanimozhi, the late Dravida Munnetra Kazhagam veteran M Karunanidhi's daughter, has chosen this constituency to enter the Lok Sabha for the first time; she is currently a member of the Rajya Sabha. Facing her is the president of the Bharatiya Janata Party's Tamil Nadu unit, Tamilisai Sounderrajan, who too boasts a political legacy, as senior Congress leader Kumari Anandan's daughter. The Thoothukudi Lok Sabha constituency consists of the assembly seats of Tiruchendur, Srivaikuntam, Tuticorin, Vilathikulam, Ottipidaram and Kovilpatti. It is a highly industrialised district with a port, and airport and rail connectivity to the rest of the country. Usually, this district is not very important during elections, but this time it is basking in its transformation as a VIP constituency. Kanimozhi was known in Tamil Nadu, but this renown extended to the rest of the country when she was imprisoned in Delhi's Tihar jail as one of the accused in the 2G scam along with former telecom minister A Raja from her party, and their subsequent acquittal in the case. 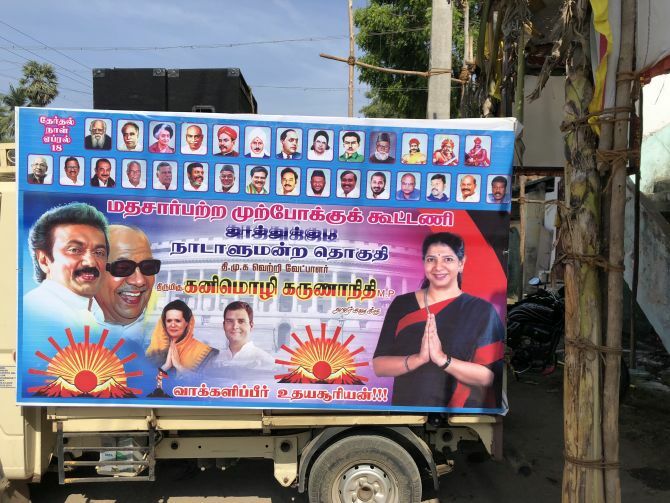 Kanimozhi had announced six months earlier that she would contest the Lok Sabha election from Thoothukudi and has since been assiduously cultivating the constituency. In the fortnight running up to the April 18 election, she has been crisscrossing the area thoroughly, visiting almost every village in this huge district which has over 1.3 million voters. In her favour is the public resentment over the police firing on Sterlite protestors last May which killed 15 people. None of the policemen involved in the incident have been punished so far, a point she does not fail to drive home at every meeting. Everyone in Tamil Nadu knows that elections in the state only become interesting when the DMK is challenged directly by the rival AIADMK. Here, her opponent is a BJP leader who belongs to the neighbouring Kanyakumari district. Tamilisai has so far not struck a chord with the voters who are upset with the BJP, which rules at the Centre, and the AIADMK, which rules the state, for the Sterlite firing. Though Tamilisai works closely with the AIADMK district secretary and Srivaikuntam MLA Shunmuganathan, workers of both parties are not happy. An AIADMK leader grumbled to this correspondent, "When the candidate came we were told to get a crowd of 1,000 people. I took 200 people as my share, and at Rs 200 a person I should have been paid Rs 40,000, but I was given only Rs 20,000." DMK cadres, on the other hand, seem happy. "Our party usually says we can win without giving out any money, but we always lose. This time, we are first off the blocks and have already distributed Rs 300 per vote." A DMK functionary was arrested with Rs 4 million in cash in Kayamozhi, a village in the district, on Monday. On Tuesday, income tax agents raided Kanimozhi's local home, only to return red faced when nothing was found. Political leaders all over the country have condemned the raid, alleging a political witch hunt. Party cadres are poring over voters lists and spreading the manna evenly. The last mile connectivity is always a local man, whether in village, town or city. So the chances of catching anyone actually distributing money is low. All seizures are made only when the money is en route, not at the point of distribution. There is also a candidate from AIADMK rebel T T V Dinakaran's party, the Amma Makkal Munnetra Kazhagam in the Thoothukudi electoral race. M Bhuvaneshwaran was on a road show in Nalumadi village with five cars and a few bikes in his convoy. The point being emphasised by his campaign's speaker is that while Kanimozhi is from Chennai, Tamilisai is from Kanyakumari, Bhuvaneshwaran, from Alwarthope in the same district, is the local in the fray. So vote for him and keep away the outsiders is the message conveyed. The AMMK is said to have identified 800,000 voters to be paid Rs 200 per vote. AMMK cadres have apparently told the party high command that the money is not enough as the other side has already paid out Rs 100 more. There are rumours that the AIADMK-BJP alliance plans to up the ante with a blitz of Rs 500 per voter, to defeat the daughter from the DMK's ruling family. DMK cadres are unruffled by this talk. "We will give another Rs 300 immediately," they say cheerfully. The candidate, after all, is Kanimozhi and they know that the sky is the limit -- for both expenses and expectations.